Shay Healy is a songwriter, broadcaster, journalist and author, best known for writing for Johnny Logan's 1980 Eurovision winner "What's Another Year". In Ireland he's a well-known TV presenter with a TV screen presence dating as far back as the late 60s. He also has a long history of appearing on TV performing frequently dreadful parody songs, especially during the llate 70s and early 80s. 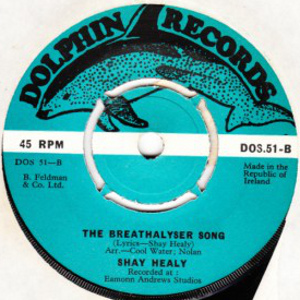 Shay Healy was born in Dublin in 1943. His mother was Mairin Ni Suilleabhain, a well known traditional singer from Killorglin in Co.Kerry who read her own children's stories on BBC Radio. At the age of 18, he joined the Irish Press Group as an assistent in the advertising features department, in 1961. He left two years later for a career in broadcasting with RTE, signing on as a trainee cameraman. 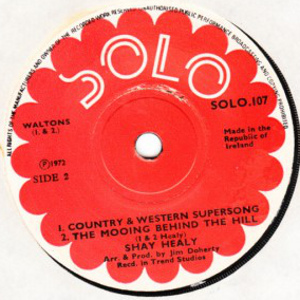 Healy was also a budding songwriter in tune with the budding folk boom of the 60s. He became the Folk Correspondent for Spotlight magazine. During the 60s Healy performed in the folk clubs in Dublin and beyond - the Coffee Kitchen, the Old Triangle, the Universal - playing folk songs as well as humorous parodies on current affairs, something for which he later became well known. He was much in demand as an MC. He played the host for The Gate Crashers, a show based around folk perfomers produced by Noel Pearson. It was essentially designed to launch the career of Pecker Dunne, but also included Al O'Donnell, Danny Doyle and Shay Healy. The Gate Crashers was also released on LP on Pearson's Tribune label. The show was very successful. Healy got his first hosting job on RTE Television on "Ballad Sheet" in 1967, the same year he married. He also worked on the "Twenty Minutes With..." show. By 1969 he was presenting "Hootenanny" on RTE. He continued to contribute to Spotlight and his name appeared under the liner notes on several albums. Some of his songs also began to be recorded by other artists: "Autumn Has Come" on Emmet Spiceland's debut LP in 1967, and "Funny in a Sad, Sad Way" on The Johnston's Give A Damn LP in 1969. Other songs were recorded by The Wolfe Tones, Johnny McEvoy, Danny Doyle, and The Fureys & Davy Arthur among others. In 1971 he presented "Reach For The Stars" (RTE), a talent show which was won by Fran O'Toole (The Miami). Then he abandoned his RTE TV career and spent four years in the USA. Healy spent a lot of time on and off in the USA during the 1970s. In his biography he claims to have played every St.Patrick's Day there between 1970 and 1980. In 1971 he emigrated to Norwood, in Boston but kept his Spotlight job, fabricating articles whenever necessary. He returned to Dublin in 1972 and recorded a 4-track EP which included "The Country & Western Supersong" which was banned by RTE. This was later recorded by Des Keogh (in 1977) and Billy Connolly (in 1979). Healy returned to the USA, settling in Nashville Tennessee for about 2 years. He opened an Irish bar called The Tara Restaurant & Bar in Nashville in June 1973. This was a joint venture with Bostonian Mike Brodbine. Healy performed regularly in the bar as a solo act, sometimes backed by Jake Mayer (bass) and John Doherty (fiddle). He also booked the Ormonde Folk for regular appearances. The Ormonde Folk were from Kilkenny and consisted of Eamonn, Peter & Margaret Brady and Jimmy Moore. While in Tennessee he got a job as head of promotions at the Mohawk Milling Company in Newport, for whom he wrote advertising jingles. Tara lasted a couple of years but the business side went sour and he left Nashville, moving to Cape Cod where he lived for about a year. He returned to Ireland in late 1975. Back in Ireland, Healy tried to play solo on the folk circuit. He toured clubs in the UK during 1976 but by his own admission he bombed. He was out of touch. In 1977 he played a gig in Kilkenny to which not a single punter came, thanks to poor advertising and public disinterest, and so he made the decision to end his solo performing career. In 1977, Healy and Niall Toibin collaborated on the script for a stage musical based on the life and work of Elvis Presley, who died on 16 August 1977. This musical was called "The King" and was produced by Noel Pearson. It opened on 21 November 1977 at the Olympia in Dublin. Cahir O'Doherty played the young Elvis, Donal McCann the fat old Elvis. 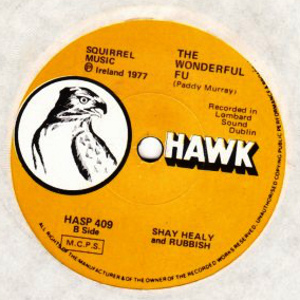 In 1977 Healy wrote a country & western parody "Lucille" which was recorded by Paddy Murray. 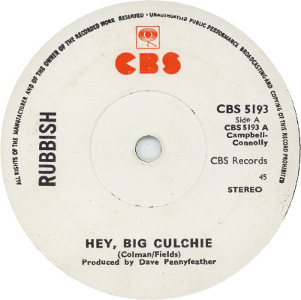 He then formed the duo Rubbish with Dave Pennefeather (ex Real McCoy). They recorded an ABBA parody "Hey C'Mere" which reached #2 in the Irish charts. They followed this with an entire LP's worth of ABBA parodies including "SOX", "Ring Ring Quasimodo", "What A Loo" and, showing they really had no shame whatsoever, "Snow On Me Snow On You". All 10 songs were recorded by a studio band which was basically Chips, but ABBA refused permission for the LP to be released. Rubbish added Alan Dee (ex Chessmen, etc) on keyboards for live gigs. 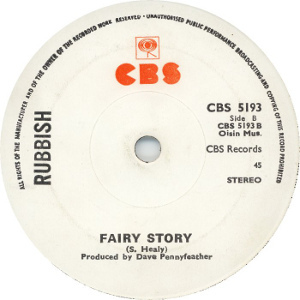 Rubbish released a single under the name Crack on the Bridge House label in the UK in 1980. "Silly Fellow" (about Paul McCarthy) scraped into the UK top #100. Famous Shamus was the name given to Healy by producer Joe O'Donnell, for the character played by Healy in the RTE Youth TV series "Hullabaloo" which he co-presented with Marion Richardson. Famous Shamus & Amazing Aonghus (Aonghus MacAnally) toured as a duo on the Two Eejits World Tour of Ireland. Healy's well-known comedy and parody songs included "West Cork West Cork" (based on "New York New York"), "The Reason Why The Hulk Is Green", "Walk On The North Side" (Lou Reed parody), "If I Were Sebastian Coe", "Big Tom Will Make Me A Star", etc. From 1978 onwards he worked behind the camera as a publicity officer for RTE2 TV. In 1979 he recorded a demo of "What's Another Year?" at Lombard Studio with Jim O'Neill (piano, vocals), John Brady (bass) and Noel Bridgeman (drums) from Brush Shiels Band, and Pat Farrell of The Business on guitar. It was originally a mid-tempo country-tinged ballad. He entered it in the National Song Contest and it was shortlisted for the final in October 1979. It was then re-recorded with Johnny Logan (AKA Sean Sherrard) on lead vocal and with a new Bill Whelan arrangement for the final. It finished first, and subsequently went on to win the 1980 Eurovision in April, making Johnny Logan famous across Europe and making Healy a very rich man. During the 1980s he recorded many demos, funded by his Eurovision win. In 1980 he wrote "It's Almost 1984", an 'amusing hymn to Armageddon', and later "Armageddown". In the spring of 1983, he received a Juno 60 synth for his fortieth birthday. With it, he wrote a space-age rock opera called The Knowledge in a single week but was unable to get the financial backing to stage it. Two years of pitching it to various labels and producers drew a blank. It included the song "Edge of the Universe" which won the Castlebar International Song Contest in 1983 and was released on a single by Lunar Records sung by Linda Martin (ex Chips). It was finally staged by youth groups in Dundalk and Sligo in the late 80s. In 1985 he wrote "Wasn't That A Party" (Tom Paxton) and in 1986 "Fish That Glow In The Dark" (about Sellafield), (which was issued in a nice PS). In the mid-80s he fronted a country rock band called Risque Business, who played Monday nights at the Coconut Grove Lounge in Stillorgan, Dublin. The band was Shay Healy (guitar), Sean Devitt (drums) and a rotating cast including Robbie Overson (lead guitar), Tony Molloy (bass), Philip Myatt (bass), John Kearns (bass), Eoin White (keyboards) and Ronan Johnson (keyboards). Another mid-80s band associated with Shay Healy was Les Fruits, a funk-rock combo active ca 1983, who played regularly at Slatterys. The main man was John Graham (vocals/guitar/bass/keboards). They released a single. In 1986 he played a solo gig in NYC with Rob Irvine, ex Chips and Bananas, who was working as Cyndi Lauper's tour manager. In the summer of 1986 he landed a job as roving reporter for RTE's "Evening Extra" which ran for two seasons. He then co-hosted a 8 week series called "The Dublin Village". In 1988, he hosted "Nighthawks", a late night satirical chat show with live music based around the concept of a diner, with a roving camera and the audience as patrons. It ran until 1992. Sometimes great, often terrible. One memorable appearance was by Simon Carmody with Johnny Thunders in tow in 1990. 7" - Dolphin Records - DOS 51 - IRL - 1969? - PS? 7" - Solo Records - SOLO 107 - IRL - 1972 - PS? 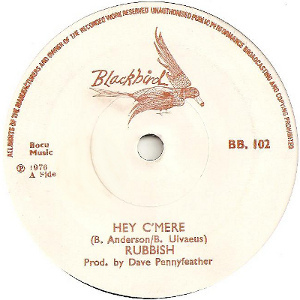 7" - Blackbird Records - BB 102 - IRL - 1977 - PS? 7" - Hawk Records - HASP 409 - IRL - 1977 - PS? 7" - CBS Records - 5193 - IRL - 1977 - PS? • Famous Shamus - Big Tom Will Make Me A Star / ? • Crack - Silly F ellow / ? • Les Fruits - Even When The Moon Is Hot, I'll Still Be Loving You Baby / ? 7" - label? - ??? - IRL - ca 1983 - PS? 7" - Bus Records - BUS 7 - IRL - 1984 - PS? Recorded at STS, produced by Shay Healy and Sean Devitt. Distributed by WEA. The fish on the front cover were supposed to glow in the dark but they don't!